1. 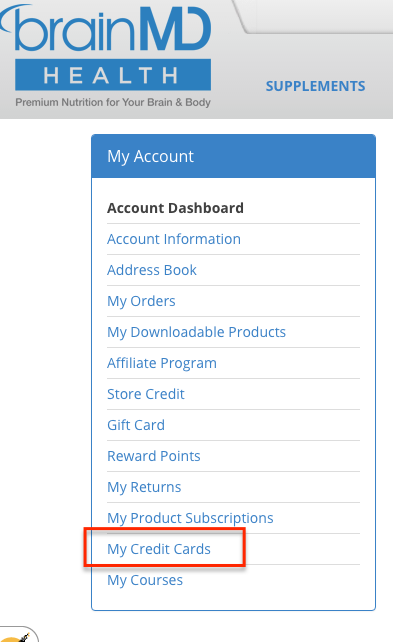 To manage your "Product Subscriptions" payment methods begin by logging in to your "Account Dashboard" by clicking the "My BrainMD" drop down menu item in the upper right hand side of your screen. Then click on the "My Account" link in the drop down menu. You can also click here to get to the account login page. 2. Once logged in to "My Dashboard" go to the left hand navigation tabs and click on "My Credit Cards." 4. 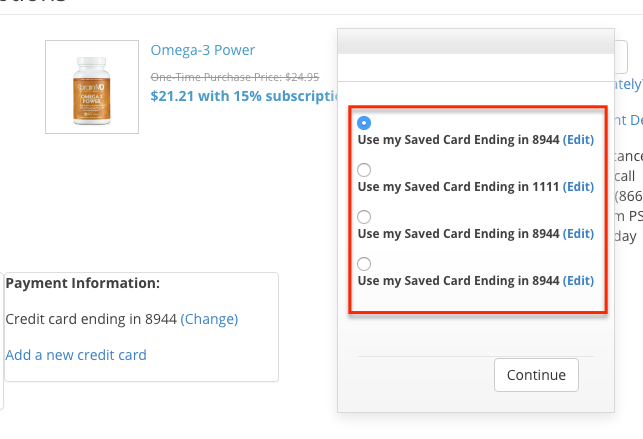 When you have completed updating your credit cards go to the "My Product Subscriptions" tab on the left hand side and update each subscription product with the new / updated credit card you wish to use for payment on your future scheduled ship dates. 5. Next to each product you wish to change your payment details click on the " Delivery and Payment Details" link (fig. A). When the "Payment Information" field opens click on the "(Change)" link next to the credit card listed (fig. B). 6. When the pop up window opens listing all existing credit cards on file select the card you wish to use for future shipments. Repeat these steps for each individual product you wish to change payment methods for. Is there any obligation to continue Auto Delivery? Can I use rewards points on my Auto Delivery order? Can I use a coupon on my Auto Delivery order? Will my credit card be charged on the exact same day of the month?